It’s an adage that writers use everything for their writing. In the case of Fire Dance, the follow-up to Ilana C. Meyer’s fantastic debut Last Song Before Night, a trip to Spain laid the floor for her novel to dance upon. The heart of a story doesn’t always come first. This one began with a visit to Andalusia, though I didn’t know it at the time. All I knew, watching torchlit Flamenco singers in a courtyard one night, was that I would use it. And had a similar thought on a garden tour in Cordoba, winding through hedge mazes. The palace in Seville with its stonework and grand spaces—I’d use it all. Writers can be obsessive in that way. In Last Song Before Night I had written about magic based on the art of poetry and music, drawing on the lore of the Celtic poets and the troubadours. A second book could expand on this theme while incorporating another art—the art of dance, inspired by the rich tradition of Flamenco. And what would the magic in a place like Al Andalus be? For this, I looked to historical sources and medieval Arab cosmology for clues. I decided on magic that would be centered on astronomy, with a structure and clear-cut rules. It would employ equipment such as an observatory, charts, astrolabes. Almanacs which foretell the positioning of stars through the year would be forbidden to the common people, so no one can idly get their hands on such power. Because their magic was never lost—unlike the poet’s enchantments in Last Song—centuries of development have resulted in a refined, sophisticated system in close alliance with the court. Into this setting I would send Lin Amaristoth, in her new role of Court Poet, to investigate a series of mysterious raids. The story moves back and forth, between the Academy of poets on its wind-torn Isle, and the exquisite court inspired by Al Andalus. Between lonely enchantments and political intrigue. I envisioned the structure of this book as a dance, back and forth between two worlds. Until those worlds collide. But sometimes we can have all the elements we need for a book, and still search for its heart. Sometimes the characters must have their say before we know what the book is about. Until then, what you have is not a book, but trappings. I wrote several beginnings to the book, several thousands of words, in the course of that search. With the help of those draft beginnings, I came to realize what I had been missing. This book is, above everything else, Lin’s story. 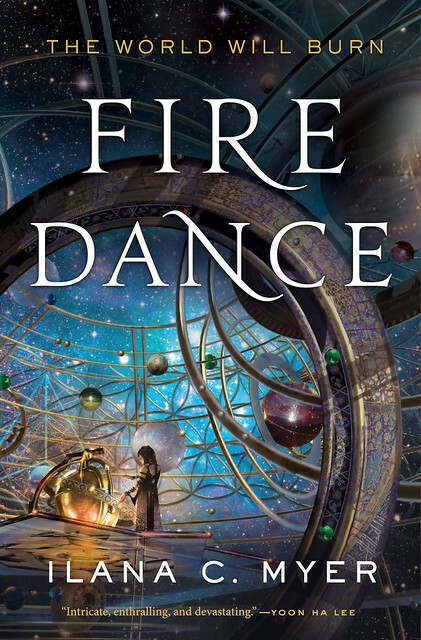 Beyond war and political intrigue and even magic, Fire Dance is about Lin’s transformation. Being in power means making choices. It also means being tested, sometimes in unbearable ways. In Last Song, Lin is a survivor. Trauma and depression are her constant companions, each day about staying alive. Finding meaning in the world is her primary motivation. In Fire Dance events have compelled her to move beyond this mindset: she has responsibilities that affect the lives of thousands of people. She doesn’t have time for herself. But she also knows an enchantment is stealing away her life—in a year she’ll be dead. The tension between desire and responsibility have replaced simple survival. The trauma of her past remains, but now there is also rage at the future. Because there is no future. She has been compressed in a sliver of time. Pure transience—what is dance, if not that? Once I found the heart of Fire Dance, the elements I had gathered coalesced, took shape in a narrative. The heart of the character, and the heart of the book, had turned out to be one and the same. 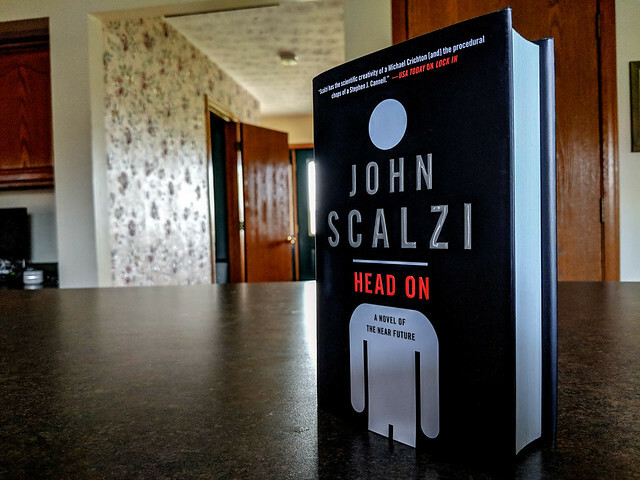 The author copies for Head On have arrived at the Scalzi Compound and they look groovy. In just a week they hit the stores. Wheee! Also, a reminder that if you want signed copies, Barnes & Noble have a bunch available for pre-order. Or you can get me to sign one for you when you come see me on tour (you can also pre-order from the stores hosting my tour and I’ll sign/personalize when I get there). I’m very excited that soon you’ll all get to read this. Soon, I say!